Fish thriving well from our save back in November during the Wolsey Fire in Malibu. The Pond Company saved fish from the burned home of Jillian Michaels. Since the rescue they have been doing well and been alive and thriving. During our emergency trek adventure into the burn zone! Animal Rescue: This video is about Koi Rescue in the Woolsey fire by Jon & Ben Rasmussen of the Pond Company. Heading into the burn zone of the Woolsey Fire to save koi fish from a pond on 11/12/18. The Nitrogen Cycle occurs naturally and invisibly on a microscopic level within a pond or water garden. It is a vital, natural process in all healthy, organic, aquatic ecosystems so it is good to know and understand this process and how it works. First, the fish waste and uneaten food becomes Ammonia. Ammonia (NH3) can be an industrially produced chemical, and it also is created and exists naturally in the environment. Ammonia is essential for many biological processes and serves as a precursor for amino acid and nucleotide synthesis; the nitrogen cycle. In the environment, ammonia is part of the nitrogen cycle and is produced in the water from bacterial processes. Ammonia naturally occurs from decomposition of organic matter, including plants, animals and animal wastes. Basically, when the fish feed, their waste (along with uneaten food) becomes ammonia. The ammonia molecule is then turned into the nitrite molecule. Nitrite is a waste produced by bacteria in the biological filter as it breaks down ammonia. 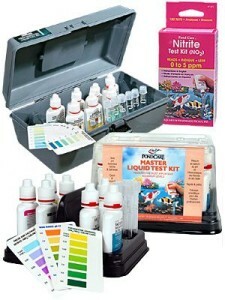 Nitrite is extremely harmful to fish if left in quantities unconverted. Tested levels of 0.25 ppm or higher are dangerous to your fish and if levels are allowed to rise up to 0.5 ppm, it can result in severe fish loss.. Biological filtration provides the environment for this nitrogen cycle to take place naturally. In this cycle naturally occurring bacteria (nitrifying bacteria or aerobic bacteria) break down the ammonia into the nitrites, and then is converted further; produces the byproduct called Nitrates. Nitrate is the byproduct of nitrifying bacteria in the biological filter breaking down ammonia and nitrite; Nitrate can be taken in by aquatic plants and algae as a nutrient for growth. High levels can lead to excessive algae growth. Levels should be kept below 40 ppm and should be tested weekly. Thus, when the fish eat, their waste/the ammonia is converted by aerobic bacteria (the good bacteria) into the nitrites, and is further converted into nitrates. Nitrates then in this cycle become “food” for the plants to grow on (fertilizer) and then in turn, the fish eat the plant material as a food source, produce ammonia …..thus creating an on-going natural process called completing the Nitrogen Cycle. 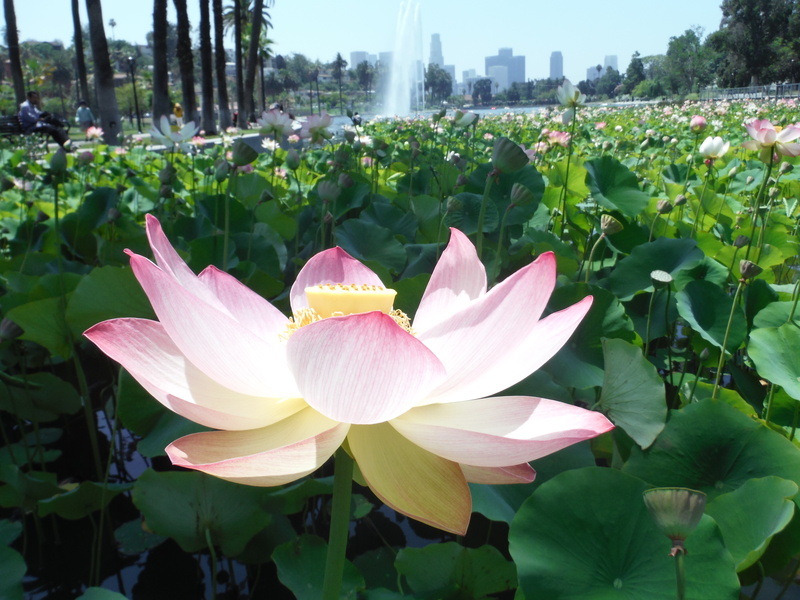 The Pond Company has been working hard to keep Echo Park looking Clean and Beautiful through our dedicated oversight and optimization over this past year of 2017. Recent work on a naturally flowing stream that runs through the hills above the Arroyo in Pasadena. 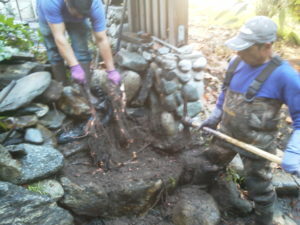 We did a re-positioning of the rocks and boulders within to create an appealing landscape for the water to flow over and through. For the rain, we adjusted boulders and placed stones in an aesthetically pleasing way. If you listen close enough the next time you’re enjoying a nice day at Echo Park Lake, you’ll be able to hear some croaking sounds coming from the lake or see a rustle in the water lilies, and now you’ll know that its the Bullfrogs making their presence known from within the wetlands! 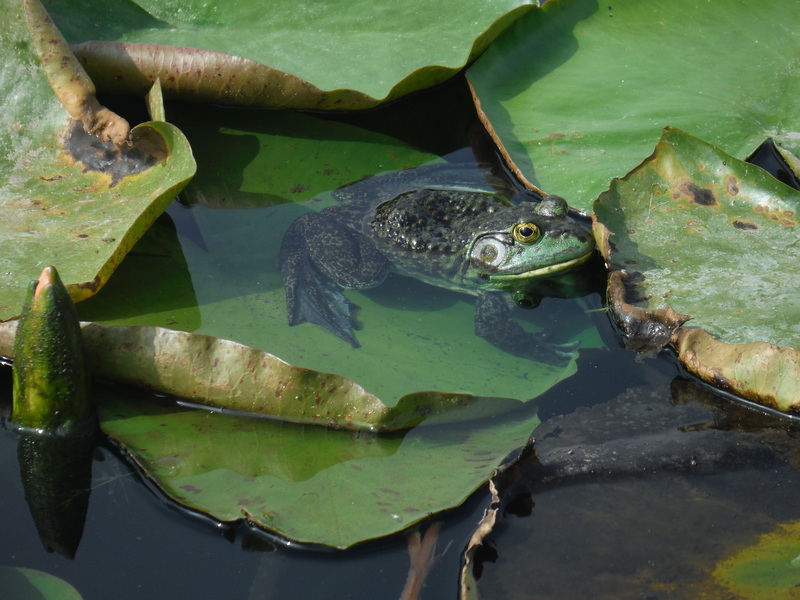 We have been noticing more and more that the Bullfrogs have been doing well and living healthy in the environment of Echo Park Lake. 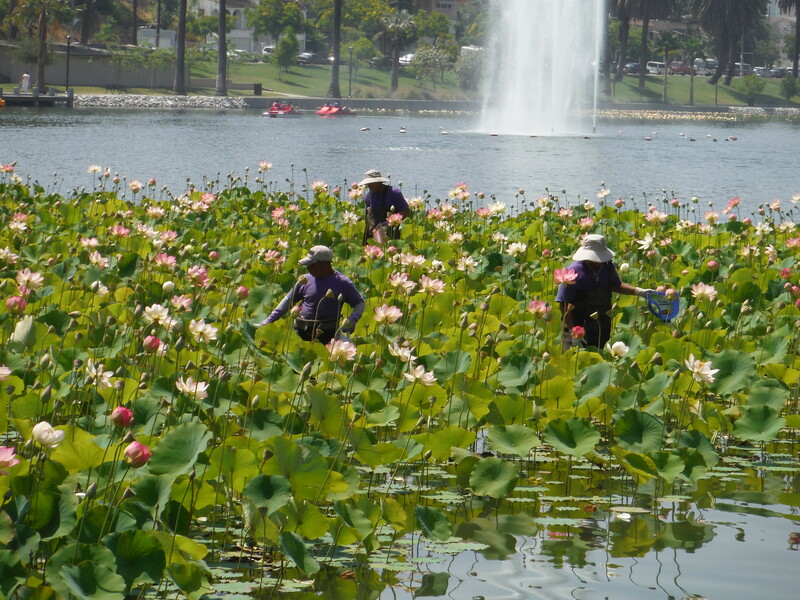 The Pond Company has been working hard and diligently to ensure that the waters are clean of trash and other debris so that the wildlife can live a healthy lifestyle out in Echo Park. We hope that our efforts can bring more wildlife to Echo Park, and also more humans to come by and enjoy a day at the park as well! Have you been to Echo Park Lake recently? The Lotus Bed and all other wetlands of the lake have been looking full and healthy throughout the Summer of 2015 thanks to the help of The Pond Company Inc. The Pond Company Crew has been going to the lake and maintaing and taking care of the lake, keeping it clean and looking fresh on a weekly basis. 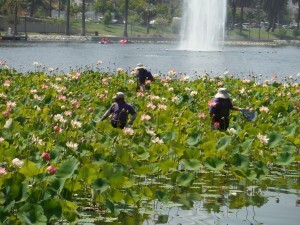 Lotus Bed was kept looking full and healthy throughout the summer and leading up the lotus festival, as you can see in the picture. 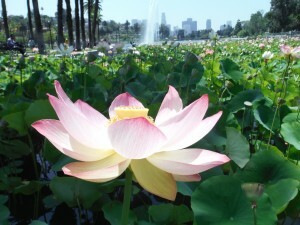 If you haven’t had a chance to come and visit the beautiful Echo Park yet, come stop by and check it out! We have been happy to hear all of the positive feedback from the public that visit the park! If you notice that any of your fish in your pond are experiencing stress, external damage to the their skin or scales, or behaving in a strange manor such as “flashing”, etc. 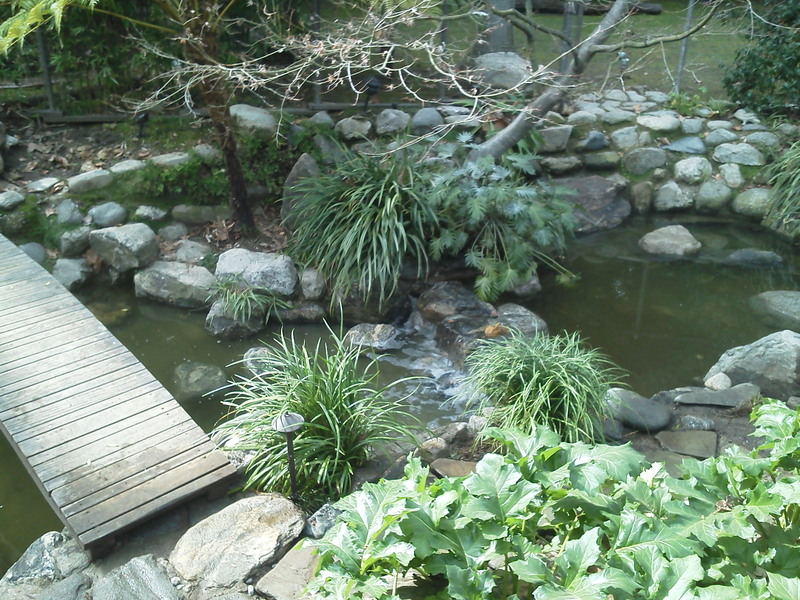 it is possible that your pond could have a disease. We highly recommend using MinnFinn to treat all common external fish diseases. 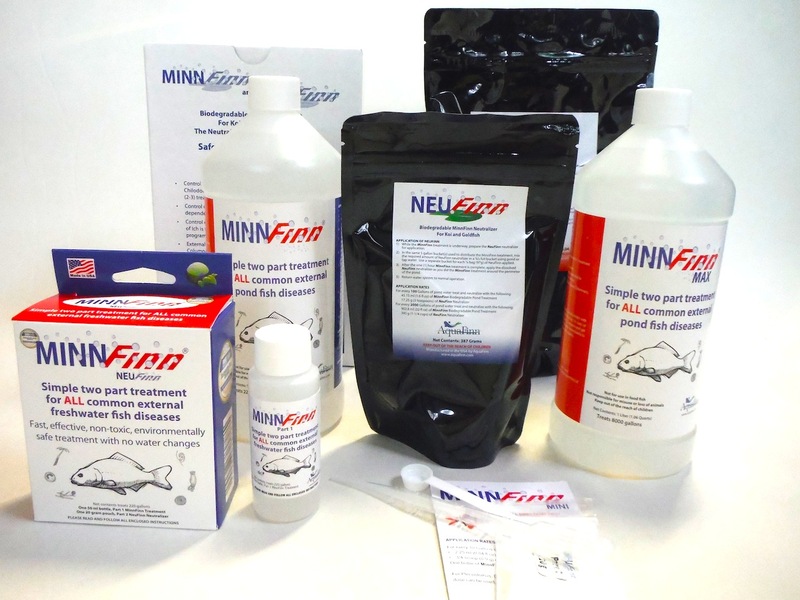 MinnFinn is one of the best medicated treatments on the market because it is simple to use (when done correctly) and has a broad range of disease treatments for your fish. Though the treatment is straightforward, we recommend that you have a professional do the treatment, because it should be done accurately and the fish should be observed to make sure the fish do not suffer from any adverse reactions. The nice thing about this product is that it is completely neutralized and safe at the completion of its application. We have a line of MinnFinn Products that include, MinnFinn Regular, MinnFinn Max, MinnFinn Mini. The water quality of your pond is important for the health and well being of your fish, plants and the overall eco-system. 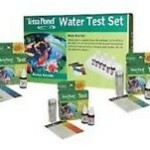 There are many ways and reasons to test your water. If for instance a chemical is spilled into the water, that chemical needs to be tested for specifically. Each of these can have a different possible reasons for taking place, and individual causes. For example: a factor such as having a high level of ammonia is very harmful to your fish, and it will damage to their gills, making it difficult for them to breathe; it will stress them out, and even possibly cause death. Once you have evaluated each of these above items, a possible solution can be found to solve problems that are occurring or even prevent them from occurring in the first place. 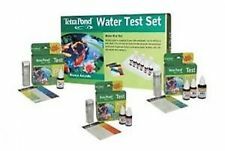 We recommend testing for these basic levels when drastic changes take place in your pond, anticipating a potential problem, as well as identifying an already existing problem. Knowing and monitoring all of these naturally occurring levels will help you to have a successful and healthy eco-system and pond. With the help of The Pond Company Inc. the Lotus Bed and all other wetlands of the lake have been looking gorgeous for the coming of Summer! 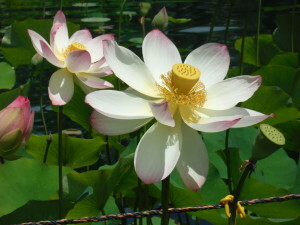 Due to the coming of the Summer Season with the weather warming up, the Lotus Bed has begun to blossom and show fantastic signs of growth this year for the upcoming Lotus Festival in July. The Pond Company crew has been out taking care of Echo Park Lake on a weekly basis for optimization and keeping the park in “ship-shape”. There is quite a large amount of algae and pond-weed growth that is on-going and being taken care of, as well as the Apple Snail population which is also being controlled. Overall, Echo Park Lake has been looking clean and well-taken care of due to the The Pond Company crew. And we have been happy to hear all of the positive feedback from the public that visit the park. Planting container: Find a large pot with a large horizontal surface area for the lily to grow. Hardy water lily has a traveling root and thus requires ample space to grow to a healthy size. 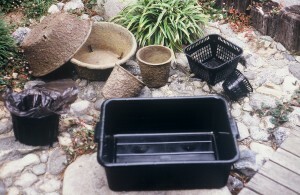 Although many other containers can be used, we recommend a container with a twenty-inch long growing area and seven inches of growing depth (see picture to the left). Place fertilizer on the bottom of your non-perforated planting container. Distribute the fertilizer evenly across bottom of the container. Then place plain garden soil (dirt with no organics or amendments) over the fertilizer placed on the bottom. Slightly moisten and pack soil. Place lily root in corner/at side of your planting container so that future lily growth is towards the center. Bury root being careful not to cover the crown of the lily (the growing end of lily where leaves and buds are coming out). Gently pack the soil around the root and place small stone or brick on top of root to ensure that it stays planted (again being careful not to damage or bury the growing crown of the lily). Plant anacharis grass around lily container (poking bundled end of grass a couple inches into the soil) gently packing soil to hold down bunch. Moisten and pack soil. 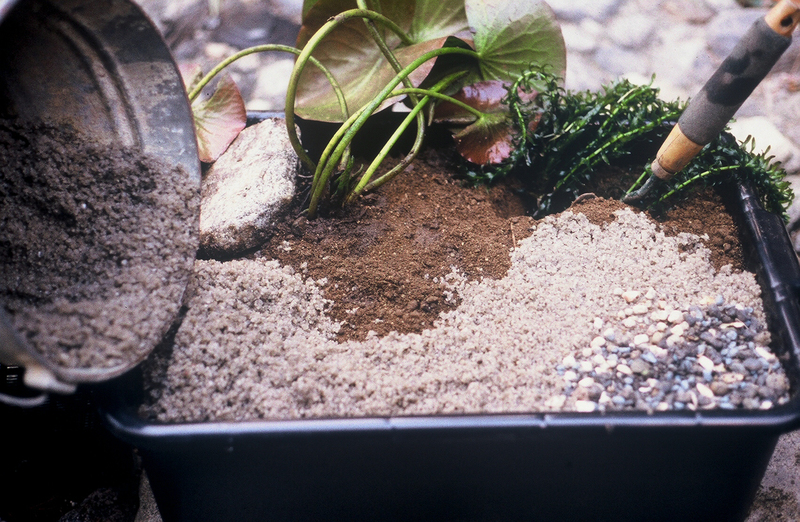 Then top with a thin layer of sand and gravel. * Replant your lily once every year. 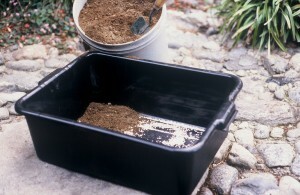 We sell the tray pictured with soil and fertilizer complete for $28.75. * Please call The Pond Company at (626) 284-5937 if you have any questions. The Pond Company Inc. is a full service company offering complete solutions to all of your pond and water gardening needs. For over 30 years The Pond Company has worked for numerous clients on both residential and commercial projects covering a wide range of fresh water landscape features including koi ponds, lily ponds, streams, waterfalls, filtration and circulation waterworks, fountains, natural mud bottom ponds, pondless water features, big to small water gardens. © 2019...The Pond Company & Pondways • content development by Smack Smog Inc.